Christine and Greg first met with us over Skype a while ago from Texas. Christine also being a photographer and both Greg and her being quite artistic people, we hit it off right away! Planning a wedding where all your guests are coming in from out of town can be difficult task. But as Christine and Greg found out, it can also be extremely exciting! 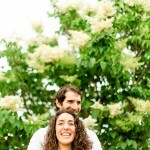 Both living in Texas, their very original and artistic wedding was to be in Montreal. We have never photographed at the boutique hotel Zero 1 in Montreal before and neither have we shot a wedding at the Tour de Levis tower, so this was quite a treat for us. All the details we so wonderfully chosen by Christine and Greg! From the beautiful bouquets, to the invites to just plainly having the reception in an old water tower! We had a lot of photo opportunities starting at the Old Port, continuing by the old silos and taking in some beautiful greenery on the island next the Tower. Kat from Unikevent made sure that everything looked perfect, everything was on time and most importantly she made sure that everyone was having the time of their lives. Along with Christine and Greg, they all succeeded in making the day absolutely stunning even with a little rain! Christine and Greg, thank you for trusting us across so many miles with capturing your special moments. We really really enjoyed spending time with you and getting to know you! Based on the love we saw on your wedding day, we can see a very loving future for you. Below are a handful of our favourite captures from the day as well as a slideshow as usual! Enjoy.